There are all kinds of upgrades you can make to your HVAC system that make your home more comfortable, healthy, and efficient. One of the most popular (and inexpensive) of those upgrades is to install a programmable thermostat. Today we’re going to discuss what programmable thermostats are and how you can benefit from installing one in your home! 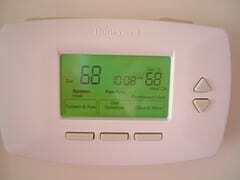 A programmable thermostat is a thermostat that stores temperature settings for specific times of day and days of the week. During those time periods, the thermostat automatically adjusts the temperature in your home according to your saved settings without you having to even think about it. For most homeowners, programmable thermostats are used to program different temperature settings during the times of day when their families are at home, at school/work or sleeping. What are the benefits of installing a programmable thermostat? Adjust your thermostat settings automatically. After you initially save the temperature settings in a programmable thermostat, your home’s temperatures will change automatically throughout the day. That means you’ll never have to worry about forgetting to change your home’s temperatures. Have your temperature settings ready when you want them. Would you like your home to be at a specific temperature right when you wake up or get home from work? With a programmable thermostat, you can time your settings just right so those temperatures will be ready for you instead of waiting for your HVAC system to catch up. Conserve energy. There’s no sense in spending extra money on heating or cooling your home when nobody is there. In addition, we don’t need our furnaces or air conditioners as much during the hours that we’re sleeping. A programmable thermostat will automatically adjust your thermostat settings during those hours of the day so that you can conserve energy and cut back on your utility bills. Extend the life of your HVAC system. By easing the load on your HVAC system when you’re family is away from home or sleeping, you put less stress on your furnace and air conditioner. This can really pay off over time because it extends the life of your units. If you have any questions about a programmable thermostat, or if you’d like a heating system serviced or installed in your home, contact Tiger, your Collinsville area plumbing, heating and air conditioning company. When it comes time to choose a new water heater in your Collinsville area home, you’ll have an array of different types of units to choose from. Although a water heater’s energy factor won’t be the only deciding factor when you’re choosing a new unit, it’s certainly one of the most important things you’ll want to consider. The energy factor (EF) of a water heater is a number that describes a unit’s energy-efficiency. The higher the EF of a given water heater, the more efficient the unit is. Every water heater is assigned an EF, and you can use it as one of the deciding factors when choosing which unit is right for your home. How is a water heater’s energy factor calculated? Recovery efficiency: This describes how efficiently the water heater is able to transfer heat from its heat source to the water. This is similar to a furnace’s AFUE rating in that it describes how effectively it is able to put the energy it consumes to good use. Standby losses: In storage tank water heaters, energy is used to keep the water in the tank hot when it’s not in use. The amount of energy that’s needed to do this (measured per hour) is known as standby loss. Cycling losses: Water loses heat as it travels through a water heater’s tank and pipes. The amount of heat that’s lost while this occurs is known as cycling loss. What is a good energy factor rating for a water heater? When you’re comparing the energy factor of different water heaters, it’s important to also keep each unit’s fuel-source in mind. Electric water heaters, for example, can have much higher EF ratings than gas water heaters, but gas is a much less expensive fuel source and is almost always going to cost less to operate. So when you’re comparing energy factors, it’s best to compare the EF’s of units that use the same fuel source. In order to qualify for the Energy Star label, gas storage water heaters must have an EF of at least 0.67; gas condensing water heaters must have an EF of at least 0.8; heat pump water heaters must have an EF of at least 2.0; gas tankless water heaters must have an EF of at least 0.82; and solar water heaters must have an EF of at least 0.5. If you have any questions about a water heater’s energy factor, or if you’d like a plumbing system serviced or installed in your home, contact Tiger, your Collinsville plumbing, heating and air conditioning company.